So, I finally stepped up to the plate, and ordered myself a new computer. It was getting to be about time, but I loved my PowerBook so much, I refused to replace it. The Apple 12" PowerBook is the best designed computer that Apple has ever engineered. But, my demands for performance in a notebook outweigh the love that I have for the form factor of that computer. I wanted a computer that was relatively fast, but more importantly, I needed storage. My music collection alone pushes 40GB at this point, and my photos are on their way to 50GB. Those two elements alone outgrow my 100GB hard drive on my 12" PowerBook. And so, the search began. Since I love the size of the small 12" design, I had no interest in a MacBook Pro, they're too big for me now. 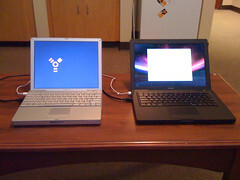 I wanted the smaller brother to the MBP, the MacBook, with it's 13" screen. Apple just released new MacBooks, great! But, they decided to pull something called "firewire" from the MacBook line, and make it an exclusive feature of the MacBook Pro's. This makes sense, because most consumers have no need for firewire. But I do. I want firewire, and I don't want a 15" screen. I'm on the hunt. The previous generation of MacBooks was just fine. They're 13", and have firewire. Looks like I found my option. But, Apple does not manufacture them anymore, since they now strictly produce the new, firewire-lacking, models. I was going to have to settle for a used one. But I don't want a used one. I don't trust people. I treat my laptops REALLY well, and I don't know a single person that I would trust to buy from, they all don't meet up to my caring requirements. I found an "old" MacBook sitting in a Pennsylvania warehouse. It was sealed, and only about two weeks old. It had been in the last batch off the assembly line, before the new models. It had everything I needed, for a heck of a deal. This machine would have been $1600 two weeks ago, when it was cool, but now, it's lame. To everyone else, this computer is way un-cool, because the new ones are out. So, the price had been cut $500. I ordered it within 24hrs of finding it. I got this sweet new machine, for $1100. I love it. 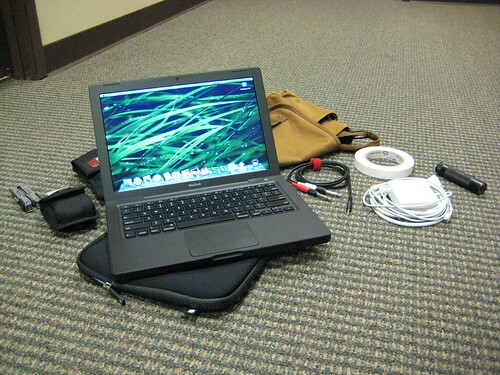 Now, it's time to send my PowerBook off to a new home. It'll be on eBay very soon! I'm no fool, I play it cool.